With our Gary Tailor custom tailored suits, you can dress more confidently than ever before. It's no secret that your appearance is the first thing that managers and executives are going to look at when you show up for an interview. Don't settle for tailored suits that fit too loosely or seem to be uncomfortably tight on you. With our custom made clothing, you can look and feel good while you attend interviews, business meetings, and other events. We have a wide variety of fabrics, colors, and designs of suit coats, slacks, shirts, tuxedos, top coats, and more. Custom made clothing is the only surefire way to shop for apparel. 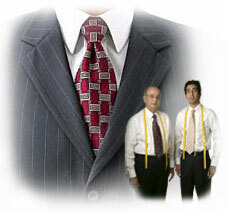 GaryTailor.com has made it our duty to take care of any question or concern that you may have. The biggest advantage to having custom made suits is the fact that you're the one who gets to decide what you like and want in a shirt or pair of pants down to the last detail. Our Hong Kong tailors are devoted to adhering to every one of your clothing needs. They make your personally created tailored shirt and ship it off to us in Texas so that we can bring it to you within 6 to 8 weeks of when you ordered it. Customized clothing is the easiest way to make a good first impression. With our custom tailored suits, you never have to worry about sleeves that are too long or waist lines that don't fit to your liking. Our Hong Kong tailors are extremely experienced in their craft. Whether you want custom tailored suits, slacks, shirts, or vests, a Hong Kong tailor can get the job done properly for you. It's hard to trust just anyone with your expensive tailored suits. You can trust GaryTailor.com, an online company, that has proven results.